I haven’t gotten too many videos online in the past 6 months. I will cite two reasons. 1. Because I’ve been busy working on other projects. 2. Because it takes time to create the type of videos I really want to create. I’ve been videoblogging for close to two years now, and at first it was very exciting. I was just getting into video editing, and learning a lot. As time went on, it seemed to take more time to create videos, maybe because I wanted to push myself creatively. I also get meticulous about metadata, so that takes time as well, and I still use an old G4, so even compressing and uploading things takes time. I know, excuses, excuses. The good news is, I will be moving up to Final Cut Pro this year. Woohoo! But dammit! I said 7 videos this week, and that’s what you will get! Stop by tinkernet.org and see what’s up. I am a (Contributing) Author! I’ve been writing this blog for almost 10 9* years now, and before that I published magazines, and music, and other things, but it’s true what they say, and actual book, is still pretty neat. A few years ago, I was asked to contribute to a technical book, but had to decline at the time due to prior commitments. 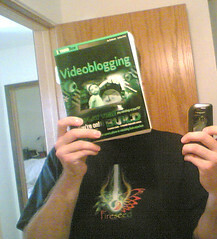 Then last year, I wrote a whole bunch of stuff for a book about videoblogging that was supposed to be put out by that publisher that tends to show an animal on the cover. That didn’t happen, but what did happen is that the authors found another publisher, and got the book done, and some of my writing is in it. So if you see the book Videoblogging published by Wiley (as part of their ExtremeTech series) take a look at the third page of the “About the Contributing Authors” section, and you will see my name. I still haven’t read the whole thing, but I’ve seen my writing on pages 312 and 327. Well, those wacky videoblogging fools at We Are The Media did a Speedvlogging Challenge! I like the speedvlogging idea because over time, as you create something (be it text, audio, or video) I think you sometimes tend to become too critical of your own work, and almost hesitant to put it out there, perhaps for worry that it doesn’t live up to your previous work, or some level of standard you’ve set for yourself. The important thing though, is to keep creating. Stay creative and productive in your work! If something doesn’t turn out exactly how you wanted it to, that’s ok, move on to the next idea. Isn’t there a saying about ideas being useless, because it’s all in the execution of those ideas?